Note: This is the fifth step in manually migrating a WordPress site to your Pro Managed WordPress account. If you don't have a Pro Managed WordPress account, you can learn more about them here. This next step in manually moving a WordPress site to a Pro Managed WordPress account: Change table prefixes in the WordPress site database. You need to use phpMyAdmin to change the prefixes. Give yourself 10-15 minutes for this part. Note: At the end of Part 4, you checked the table prefix in the site database. If that table prefix is not "wp", continue with the rest of this article. If that table prefix is "wp", skip this part and continue with Part 6. If you still have the phpMyAdmin page open for the site, continue with the next step. Otherwise, open phpMyAdmin for the Pro Managed WordPress site. 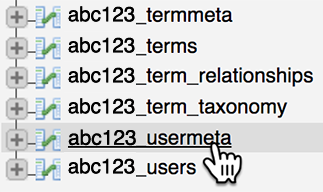 In the list of tables, click the table name ending in usermeta. Highlight and delete the current code in the editing window. Note: If your original WordPress database had a table prefix other than wp_, then you should replace the first wp_ in the code sample with the original prefix. However, the wp_% should never be changed. Click Go. The usermeta table is updated. In the list of tables, click the table name ending in options. Click SQL, and then remove the existing code again. Replace tablePrefix with the table prefix you copied earlier. Be careful not to delete the underscore character after the table prefix. Click Go. The options table is updated. Close the phpMyAdmin page, but hang on to the table prefix - you'll need that in the next part. The last part!